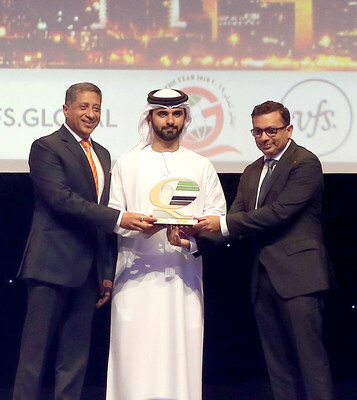 Dubai, UAE, April 5, 2019 /PRNewswire/ -- VFS Global, the world's largest outsourcing and technology services specialist for diplomatic missions worldwide, is proud to announce it has received two very prestigious awards — Dubai Quality Global Award (DQGA) and a 5 Star Rating in the Emirates Business Rating Scheme (EBRS) — at the prestigious 25th Annual Business Excellence Awards. Both the awards were presented under the Service Sector category. His Highness Sheikh Mansoor bin Mohammed bin Rashid Al Maktoum bestowed the Dubai Quality Global Award (DQGA) – for Service Sector on Zubin Karkaria, Chief Executive Officer, VFS Global Group, at the awards ceremony. Her Excellency Ohood Bint Khalfan Al Roumi, Minister of State for Happiness and Wellbeing and the Director General of the Prime Minister's Office of UAE awarded the CEO of VFS Global Group for achieving 5 Star Rating in the Emirates Business Rating Scheme (EBRS). The EBRS and DQGA awards are based on the European Foundation for Quality Management - Business Excellence program. Dubai Quality Award was launched in 1994 and recently it has earned global recognition making it Dubai Quality Global Award. VFS Global was assessed as a winner based on the RADAR Assessment and Management evaluation method which assesses each company on nine criteria – viz. Leadership, Strategy, People, Partnership & Resources, Processes, Products & Services, People Results, Customer Results, Society Results and Business Results. Emirates Business Rating Scheme has been recently launched by the Dubai Economy in partnership with the Prime Minister's Office and Business Excellence Department to enhance the overall service levels across the Emirates.